Southern Min dialects are spoken in Fujian, three southeastern counties of Zhejiang, the Zhoushan archipelago off Ningbo in Zhejiang, and the Chaoshan (Teo-swa) region in Guangdong. The variant spoken in Leizhou, Guangdong as well as Hainan is Hainanese and is not mutually intelligible with mainstream Southern Min or Teochew. Hainanese is classified in some schemes as part of Southern Min and in other schemes as separate. Puxian Min was originally based on the Quanzhou dialect, but over time became heavily influenced by Eastern Min, eventually losing intelligibility with Minnan. Southern Min dialects lack a standardized written language. Southern Min speakers are taught how to read Standard Chinese in school. As a result, there has not been an urgent need to develop a writing system. In recent years, an increasing number of Southern Min speakers have become interested in developing a standard writing system, either by using Chinese Characters, or using Romanized script. Systems such as Pe̍h-ōe-jī exist for phonetic writing of Hokkien. The Amoy dialect or Xiamen dialect (Chinese: 廈門話; Pe̍h-ōe-jī: Ē-mn̂g-ōe), also known as Amoynese, Amoy Hokkien, Xiamenese or Xiamen Hokkien, is a dialect of Hokkien spoken in the city of Xiamen (historically known as "Amoy") and its surrounding metropolitan area, in the southern part of Fujian province. Currently, it is one of the most widely researched and studied varieties of Southern Min. It has historically come to be one of the more standardized varieties. 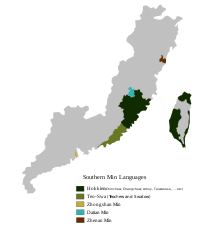 Most present-day publications in Southern Min are mostly based on this dialect.Spoken Amoynese and Taiwanese are both mixtures of the Quanzhou and Zhangzhou spoken dialects. As such, they are very closely aligned phonologically. However, there are some subtle differences between the two, as a result of physical separation and other historical factors. The lexical differences between the two are slightly more pronounced. Generally speaking, the Southern Min dialects spoken in Xiamen, Quanzhou, Zhangzhou, Taiwan, Southeast Asia and Overseas Communities are mutually intelligible, with only slight differences. Bbánlám Hōng'ggián Pìngyīm Hōng'àn (Chinese: 閩南方言拼音方案), Bbánlám pìngyīm, Minnan pinyin or simply pingyim, is a romanization system for Hokkien Southern Min, in particular the Amoy (Xiamen) version of this language. Haifeng dialect, Lufeng dialect or Hailufeng dialect is a variety of Chinese mostly spoken in Shanwei, Haifeng County, and Lufeng, Guangdong. It classified as a variety of Southern Min (Min Nan) and it is also alleged by some to supposedly be a variety of Teochew dialect due to its close geographical and political ties, even though it is much more similar to the Hokkien language instead and Hailufeng Min Nan speakers see themselves as Hokkiens and separate from the Teochews. Since many of the pronunciations of Chinese characters, vocabulary, accent and slangs in Haifeng dialect are different from those in Teochew dialect because of different rimes in both dialects, Haifeng is considered to be independent of Teochew. Such differences include the preservation of the final codas -t and -n in the Haifengese Hokkien which are completely lost in Teochew, as well as the absence of the -oi finals. Hainanese (Hainan Romanised: Hái-nâm-oe, simplified Chinese: 海南话; traditional Chinese: 海南話; pinyin: Hǎinán huà), also known as Qióng Wén (simplified Chinese: 琼文; traditional Chinese: 瓊文) or Qióng yǔ (瓊語; 琼语), is a group of Min Chinese varieties spoken in the southern Chinese island province of Hainan. In the classification of Yuan Jiahua, it was included in the Southern Min group, although it is mutually unintelligible with Southern Min varieties such as Hokkien–Taiwanese and Teochew. In the classification of Li Rong, used by the Language Atlas of China, it was treated as a separate Min subgroup. Hou Jingyi combined it with Leizhou Min, spoken on the neighboring mainland Leizhou Peninsula, in a Qiong–Lei group. "Hainanese" is also used for the language of the Li people living in Hainan, but generally refers to Min varieties spoken in Hainan. Hokkien (; from Chinese: 福建話; pinyin: Fújiànhuà; Pe̍h-ōe-jī: Hok-kiàn-ōe) or Minnan language (閩南語/闽南语), is a Southern Min Chinese dialect group originating from the Minnan region in the south-eastern part of Fujian Province in Southeastern China, and spoken widely there. It is also spoken widely in Taiwan and by the Chinese diaspora in Malaysia, Singapore, Indonesia, the Philippines and other parts of Southeast Asia, and by other overseas Chinese all over the world. It is the mainstream form of Southern Min. Hokkien historically served as the lingua franca amongst overseas Chinese communities of all dialects and subgroups in Southeast Asia, and remains today as the most spoken variety of Chinese in the region, including in Singapore, Malaysia, Indonesia, Philippines and some parts of Indochina (particularly Thailand, Laos and Cambodia).The Betawi Malay language, spoken by some five million people in and around the Indonesian capital Jakarta, includes numerous Hokkien loanwords due to the significant influence of the Chinese Indonesian diaspora, most of whom are of Hokkien ancestry and origin. Taiwanese pop (Chinese: 台語流行音樂), Tai-pop, T-pop, Minnan Pop and Taiwanese song (台灣歌), is a C-Pop genre sung in Taiwanese Hokkien and produced mainly in Taiwan. Hokkien pop is the most popular amongst Hoklo people in Taiwan, Mainland China, and the Overseas Chinese in Southeast Asia. Longyan Min (龍巖閩語) or Longyan Minnan (龍巖閩南語), is a variety of Southern Min language spoken in the urban city area of Longyan (eastern Longyan) in the province of Fujian while Hakka is spoken in rural villages of longyan (western part) by the peasantry. The Longyan Min people had settled in the region from southern part of Fujian Province as early as the Tang dynasty period (618–907). Although Longyan Min has some Hakka influence to a limited extent by the peasant Hakka Chinese language due to close distance of rural village Hakka peasants of the region, Longyan Min is a close dialect of the Minnan language and has more number of tones than Hakka (8 as compared to 6). Longyan Min has a high but limited intelligibility with Southern Min dialects such as Hokkien–Taiwanese. Today, Longyan Minnan is predominantly spoken in Longyan's urban district Xinluo District while Zhangzhou Minnan is spoken in Zhangping City. Hakka on the other hand is spoken in the nom-urban rest of the rural areas of Longyan prefecture: Changting County, Yongding County, Shanghang County, Liancheng County and Wuping County.Branner suggests that the Xinluo and Zhangping dialects should be grouped with the Datian dialect as a coastal Min group separate from both Southern Min and Eastern Min. However, he argues that the dialect of Wan'an township, in the northern part of Xinluo district, is a coastal Min variety separate from all of these. Min or Miin (simplified Chinese: 闽语; traditional Chinese: 閩語; pinyin: Mǐn yǔ; Pe̍h-ōe-jī: Bân gú; BUC: Mìng ngṳ̄) is a broad group of Chinese varieties spoken by about 30 million people in Fujian province as well as by 45 million descendents of migrants from this province in Guangdong (around Chaozhou-Shantou, or Chaoshan area, Leizhou peninsula and Part of Zhongshan), Hainan, three counties in southern Zhejiang, Zhoushan archipelago off Ningbo, some towns in Liyang, Jiangyin City in Jiangsu province, and Taiwan. The name is derived from the Min River in Fujian, which is also the abbreviated name of Fujian Province. Min varieties are not mutually intelligible with each other or with any other varieties of Chinese. There are many Min speakers among overseas Chinese in Southeast Asia. The most widely spoken variety of Min outside Fujian is Southern Min (Min Nan), also known as Hokkien-Taiwanese (which includes Taiwanese and Amoy). Many Min languages have retained notable features of the Old Chinese language, and there is linguistic evidence that not all Min varieties are directly descended from Middle Chinese of the Sui–Tang dynasties. Min languages are believed to have a significant linguistic substrate from the languages of the inhabitants of the region prior to its sinicization. The Nanlang dialect, is a Chinese variety mostly spoken in Nanlang in Guangdong, China. It belongs to the Southern Min group, more specifically Zhongshan Min. Pe̍h-ōe-jī (Taiwanese Hokkien: [peʔ˩ u̯e˩ d͡ʑi˨] (listen), abbreviated POJ, literally vernacular writing, also known as Church Romanization) is an orthography used to write variants of Southern Min Chinese, particularly Taiwanese Hokkien and Amoy Hokkien. Developed by Western missionaries working among the Chinese diaspora in Southeast Asia in the 19th century and refined by missionaries working in Xiamen and Tainan, it uses a modified Latin alphabet and some diacritics to represent the spoken language. After initial success in Fujian, POJ became most widespread in Taiwan and, in the mid-20th century, there were over 100,000 people literate in POJ. A large amount of printed material, religious and secular, has been produced in the script, including Taiwan's first newspaper, the Taiwan Church News. During Taiwan under Japanese rule (1895–1945), the use of Pe̍h-ōe-jī was suppressed and it faced further countermeasures during the Kuomintang martial law period (1947–1987). In Fujian, use declined after the establishment of the People's Republic of China (1949) and in the early 21st century the system was not in general use there. Taiwanese Christians, non-native learners of Southern Min, and native-speaker enthusiasts in Taiwan are among those that continue to use Pe̍h-ōe-jī. Full native computer support was developed in 2004, and users can now call on fonts, input methods, and extensive online dictionaries. Rival writing systems have evolved, and there is ongoing debate within the Taiwanese mother tongue movement as to which system should be used. Versions of pe̍h-ōe-jī have been devised for other Chinese varieties, including Hakka and Teochew Southern Min. In the 2006, the Taiwanese Romanization System was developed based on pe̍h-ōe-jī for official use to write Hokkien phonetically. Puxian (Hinghwa Romanized: Pó-sing-gṳ̂/莆仙語; simplified Chinese: 莆仙话; traditional Chinese: 莆仙話; pinyin: Púxiānhuà), also known as Pu-Xian Chinese, Puxian Min, Xinghua or Hinghwa (Hing-hua̍-gṳ̂/興化語; simplified Chinese: 兴化语; traditional Chinese: 興化語; pinyin: Xīnghuàyǔ), is a branch of Min Chinese. Puxian is spoken mostly in Fujian province, particularly in Putian city and Xianyou County (after which it is named), parts of Fuzhou, and parts of Quanzhou. It is also widely used as the mother tongue in Wuqiu Township, Kinmen County, Fujian Province, Republic of China. More than 2000 people in Shacheng, Fuding in northern Fujian also speak Puxian. There are minor differences between the dialects of Putian and Xianyou. Overseas populations of Puxian speakers exist in Malaysia, Indonesia and Singapore. Speakers of Puxian are also known as Henghua, Hinghua, or Xinghua. The Sanxiang dialect, is a Chinese variety mostly spoken in Sanxiang in Guangdong, China. It belongs to the Southern Min group, more specifically Zhongshan Min. The Shantou dialect, formerly known as the Swatow dialect, is a dialect mostly spoken in Shantou in Guangdong, China. It is a sub-dialect of the Teochew variety of Southern Min. The Southern Min Wikipedia (Pe̍h-ōe-jī: Wikipedia Bân-lâm-gú) or Holopedia is the Southern Min edition of Wikipedia, the free encyclopedia. It is the second largest Wikipedia in a variety of Chinese. Written in Pe̍h-ōe-jī, it mainly uses the Hokkien Taiwanese dialect. As of November 2016, it has over 200,000 articles. The Taiwanese Romanization System (Taiwanese Romanization: Tâi-uân Lô-má-jī Phing-im Hong-àn, Chinese: 臺灣閩南語羅馬字拼音方案; pinyin: Táiwān Mǐnnányǔ Luómǎzì Pīnyīn Fāng'àn; Pe̍h-ōe-jī: Tâi-oân Lô-má-jī Pheng-im Hong-àn; often referred to as Tâi-lô) is a transcription system for Taiwanese Hokkien. It is derived from Pe̍h-ōe-jī and since 2006 has been one of the officially promoted phonetic notation system by Taiwan's Ministry of Education. It is nearly identical to Taiwanese Language Phonetic Alphabet (TLPA) Romanization for Hakka apart from using ts tsh j instead of c ch j for the fricatives /ts tsʰ dz/. Teochew (Chinese: 潮州話 or 潮汕話; pinyin: Cháozhōuhuà or Cháoshànhuà, Chaozhou dialect: Diê⁵ziu¹ uê⁷; Shantou dialect: Dio⁵ziu¹ uê⁷) is a Southern Min dialect spoken mainly by the Teochew people in the Chaoshan region of eastern Guangdong and by their diaspora around the world. It is sometimes referred to as Chiuchow, its Cantonese name, due to the english romanisation by English colonial officials and explorers. It is closely related to some dialects of Hokkien, as it shares some cognates and phonology with it, though both are not largely mutually intelligible. Teochew preserves many Old Chinese pronunciations and vocabulary that have been lost in some of the other modern varieties of Chinese. As such, many linguists consider Teochew one of the most conservative Chinese dialects. The Zhanjiang dialect is a dialect mostly spoken in Zhanjiang in Guangdong, China. It is a sub-dialect of Leizhou Min. It is considered to be part of Southern Min though it has little mutual intelligibility with Minnan Proper (Hokkien-Taiwanese) and Teochew. Zhongshan Min (Chinese: 中山閩語), is a group of Min Chinese varieties spoken in the Zhongshan region of the southern Chinese province of Guangdong. The Zhongshan Min people settled in the region from Fujian Province as early as the Northern Song dynasty period (1023–1031). Sanxiang dialect, spoken in Sanxiang in the south.According to Nicholas Bodman, the Longdu and Nanlang dialects belong to the Eastern Min group, while the Sanxiang dialect belongs to Southern Min. All three have been heavily influenced by the Shiqi dialect, the local variety of Yue Chinese.